LOS ANGELES (AP) ― After insisting that space relations wouldn’t be altered by earthly politics, NASA on Wednesday said it was severing ties with Russia except for the International Space Station. NASA employees can’t travel to Russia or host visitors until further notice. They’re also barred from emailing or holding teleconferences with their Russian counterparts because of Russia’s actions in Ukraine, according to a memo sent to workers. Activities related to the space station are exempt. NASA and Russia’s space agency will “continue to work together to maintain safe and continuous operation” of the space station, NASA said in a statement released late Wednesday. Since the retirement of the space shuttle, NASA has depended on Russia to hitch rides to the giant orbiting outpost, paying nearly $71 million for a seat on the Soyuz. A Russian rocket last week delivered three astronauts, including American Steve Swanson. The laboratory is a partnership of the U.S., Russia, Europe, Japan and Canada. 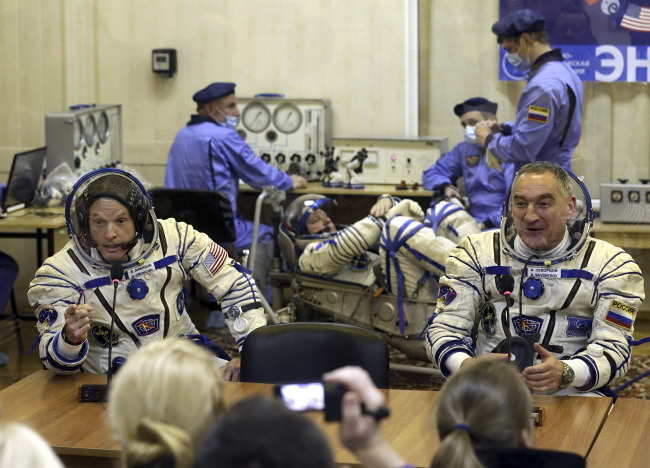 U.S. astronauts train in Russia before flying to the space station and the new directive was not expected to affect that. The move comes after reassurances that U.S.-Russia space relations were fine despite tensions over Ukraine. “Right now, everything is normal in our relationship with the Russians,” NASA administrator Charles Bolden said during a NASA budget teleconference on March 4. NASA reiterated the sentiment last week after Russia annexed the Crimean Peninsula from Ukraine. “We do not expect the current Russia-Ukraine situation to have an impact on our longstanding civil space cooperation with Russia, which goes back decades,” an agency statement said. After the memo leaked Wednesday, NASA confirmed it was suspending most contact with Russia. But it also took a swipe at Congress, noting that it wouldn’t be relying on Russia to fly to the space station if funding hadn’t been cut. The space agency said it’s looking at private rocket companies to ferry astronauts in 2017. Space policy experts said they’re not surprised with the latest guideline because similar memos suspending Russian contact went out to other federal agencies. Earlier this week, Congress and NATO took steps to punish Russia for its actions in Ukraine. Congress sent President Barack Obama a bill to provide $1 billion in loan guarantees to Ukraine and add to sanctions against Russia. NATO’s foreign ministers ordered an end to civilian and military cooperation with Russia. Scott Pace, space policy director at George Washington University, said it’s noteworthy that the cooperation on the space station remains intact. “We and the Russians have a very deep and integrated relationship. We are reliant on them as they are on us,” he said.